We can offer such a wide variety of chains that we are able to provide a specific chain to conform to British and European standards or ANSI American standards as per your requirement. This CHAIN PRODUCT is based on the minimum tensile strength, the pitch, the type of pin and roller and the features of the plates. The minimum tensile strength, according to preferred numbers, ranges. 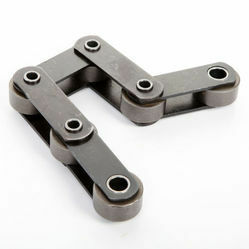 The pins of these chains are usually solid, but the standard allows them to be produced with hollow pins so that accessories as cross bars fixed to them when two chains are working in parallel. - The pitch needs to be chosen on the basis of the operating conditions, the type of product to be conveyed, the frequency of accessories, the space available, etc. Single Pitch Attachment Chain. Single pitch attachment chains are based on roller chains. Standard attachment are much economical than specially designed. 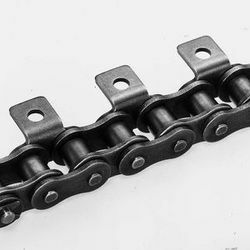 ‘’Roller chain’’ or ‘’bush roller’’ chain is the type of chain drive commonly used for transmission of mechanical power on many kinds of domestic, industrial and agricultural machinery like wire mesh conveyors ,printing presses, cars, motorcycles, and bicycles etc.. . It consists of a series of short cylindrical rollers held together by side links. 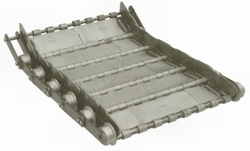 Roller chains are used in low- to mid-speed drives. 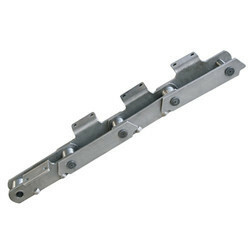 We offer a range of Simplex, Duplex and Triplex roller chains. Duplex roller chains consist of another row of plates providing the same number of sprocket teeth slots running in parallel to the first two in a simplex model, with roller bearings and pins in between. The triplex variants have yet another row of plates, making four in total with enough space for three sprockets. These are commonly seen as timing chains in automotive engines, among other things. 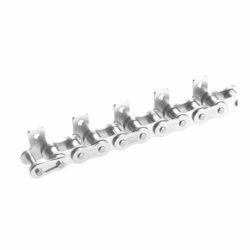 We can offer such a wide variety of chains that we are able to provide a specific roller chain to conform with British and European standards or ANSI American standards as per your requirement. Pusher dog chains are mainly used for smooth transportation of goods for industrial purpose. It pushes the product in a positive locking connection. Mainly manufactured in SS with sturdy & robust design to sustain the same for long period. This device become essential for elevating or lowering a variety of containers, Bags, Pallets, Drums and other products when space is a concern. It can handle various types of material without any changes in structure & carrying platform. Bucket Elevator Chain is based on standard large pitch conveyor chain. Buckets are spaced evenly over the length of chain and will be scooped and conveying the material in vertical direction. Three main features of the chain will be its Superior wear resistance of pins and bushings, which reduces chain elongation. Commonly used in Vertical conveyance of grain and other bulk materials for the cement, chemical, and food industries. This is very important because of the limited space in the elevator housing. Chain must be easy to handle. Generally this type of conveyor is used for transportation, accumulation, assembly, side loading and unloading and frequent start/stop applications. As it offers solid conveying it is mostly used in assembly lines. It is popular for easy installation & quality. Made with best grades of Carbon Steel, Alloy Steel and Stainless Steel. Steel grades are used in variety which gives durability and low coefficient of friction along with maximum output to the equipment. The chains are mainly used in Food, Pigment, Paper Mill processing industry, Cement & steel plants. • The hollow pin is at the centre of articulation, and always keeps the pitch length. Regardless of whether the chain is straight or wrapping around the sprocket, the centre distance of attachments is always the same. • With a cross rod over two chains, the load from the attachments is distributed equally between the link plates. The chain can fully utilise its strength and will not twist. • Easy to change, maintain, and adjustment. The word “Drag” relates to all styles; scraper, paddle or en-masse because each type of conveyance moves the chain and product forward to the discharge. The scraper/paddle style chain conveyors work on the physical push/pull principles of moving a product at the height of a tall full flight. Which can transfer granular or aggregate product at the full rate over a distance that may include a level change while protecting the transported material from the weather. Scraper chain conveyors can be used for cooling or dehydrating product during transfer (through air or water circulation), mixing and measuring, bulk handling for storage, process supplying, extracting, distributing at several points, picking up the product, and lifting decanted or washed product. Scraper chains conveyor and accessories are used in scraper conveyors for ash removal system of thermal power plants which are required to operate continuously. Due to constant abrasion of these chain links against each other as well as due to the abrasive material which is being handled in the ash removal system, surface treated chains are essential to give a reasonable service life and to work without frequent replacement. 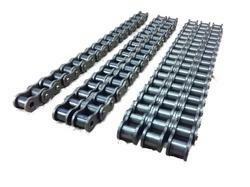 Deep link Conveyor Chains with top plates also available. These type of chains are mainly used in Automobile & container assembly lines as well as steel conveyor lines in the steel industry. Standard attachments are much economical than specially designed.